This postcard has ‘POST CARD’ printed on the back but no information other than the engine number, 5102. The engine is ‘Whitworth’ or ‘Waterloo’ or ‘6ft Jumbo’ or ‘Small Jumbo’ LMS No.5102 Cuckoo. But what is the train, where is it and when? First thought [don’t fully know why!] — the Cumbrian Coast Line — the single line section — that telegraph pole looks rather close to the line? I think this train might be approaching St Bees from the South. I have seen a contemporary photo of “Cuckoo” at Seascale, a few miles to the South. The 25—inch Ordnance Survey plan confirms Matthew Shield’s suggestion; the photograph was taken from about 500 yards south of St Bees station, looking south. The houses up on the left would be Blythe Place; the signal post in the right distance is also marked on the plan. 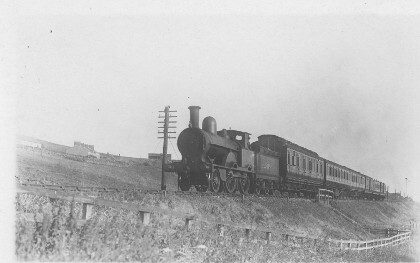 By the engine’s number the date would be between 1926 and 1931.